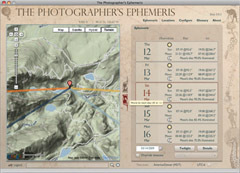 The Photographer’s Ephemeris is an essential tool for any landscape photographer, because it helps show you where the Sun and moon will rise or set, and overlays that on top of a Google map. 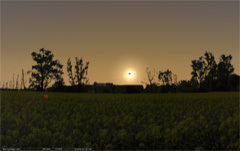 If you’d like to try and photograph the eclipse as part of a landscape, then this software can help show you where the Sun and moon will be in relation to a particular landscape feature (such as a mountain or lake). There’s a free desktop version, and an inexpensive iPhone/iPad/Android version as well. Stellarium is a free tool for visualizing the positions of stars and planets for a specific time and location. So, you can use this software to see what the eclipse will look like at a specific time and see how high in the sky the Sun/moon will be. In order to photograph the eclipse, you’ll need some clear skies, so it’s important to rely on some good weather forecasts. I’ve been using Weather Underground for a few years now, and they seem to be pretty reliable. 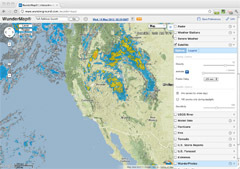 They also have a great tool that shows cloud cover on top of a Google map. Several of us have discovered that Stellarium and the Nasa App disagree significantly about where the centerline of the eclipse is. Stellarium shows the moon exactly centered in the sun from Reno, NV while the Nasa App has it 35km to the North East of Reno. CalSky.com also disagrees with Stellarium. Enjoy the eclipse. We don’t get one Down Under until November. This will give me plenty of time to find out how everybody else captures it. How does Photographer’s Ephemeris compare to LightTac which is half the cost? Looks like LightTrac pretty much does the same thing. It was WONDERFUL! We watched as the clouds continued gathering throughout the day here in No. California. My trustee camera and 75-300 mm was outfitted with welders glass and electrical tape. Originally the plan was to head to the mouth of the Klamath River where we’d be in direct alignment. Thanks to the fog we drove instead to Lyon’s Ranch in Redwood National Park and hiked up to the hills to get just a little closer. Once the eclipse began, I began shooting – these turned out much better than the conditions warranted. That green glass just filtered all that stuff out! ISO 100/Shutter 1/1000, F 11 on a tripod. But the most spectacular moment was AFTER the eclipse. At 6:35 the evening light is typically a little tired – but the hills were awash in the most glorious glow. Quite an event to witness ~ Thanks for your reminder and tips! Great post! I missed that day. I am going to check your and others’ eclipse photographs.